Couple New pieces that I finished up today. 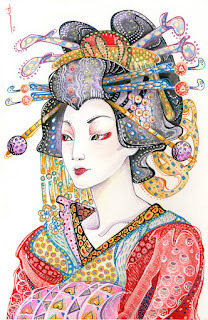 The Geisha (Oiran) is a continuation of my "Oh Oiran!" Artbook idea done in the alebrije (Mexican Folk Art style) It took all day, but it was really fun to try and slip my style in there amongst all the patterns. Mash ups are fun. I've been watching too much Glee. OI. Anyway, also another dog muse done as a commission to a Chinese Crested owner. Scandalous! Other than that, trying to get some cosplay stuff done for this weekend since it's Connecticon. If you're there and see a Fushigi Yuugi group wondering around, I'll be Tasuki. Or as I like to call him, the angry flaming Ginger. My soul will leave as I put the wig on. Hopefully more oiran to come soon, just gotta get through a few more deadlines on the list.